With the arrival of fall comes the persimmon season. I have great memories of my father going to Happy Valley in Hong Kong to bring back persimmons and cocktail buns (the iconic HK bun created by my grandfather’s bakery back in the day). I grew up thinking persimmons were always gooey on the inside but when I started shopping at the farmer’s market in California, I realized there is also another kind of persimmon that is hard on the inside: the Fuyu persimmon. I like chopping it into little cubes and tossing them into salads. 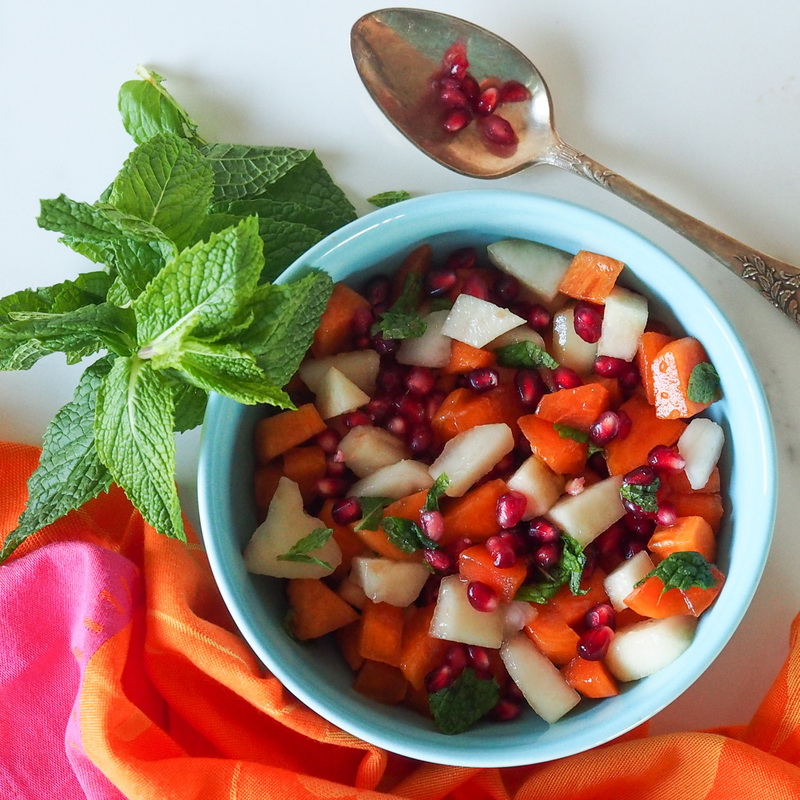 My friend Dana introduced me to this fall fruit salad last year and I remember finishing her whole bowl that contained at least 6 cups of this fruit salad. I just couldn’t stop myself it’s addictive! Cut up the persimmons and the pear into cubes. Remove pomegranate seeds from fruit. This is not an easy task! I suggest wearing an apron to avoid staining your clothes. Using a wooden spoon and beating the pomegranate half is a neat trick to accelerate the process. Cut up some mint and toss everything with a little bit of honey.